As concerns began to grow late last week that the Trump Administration was leaning toward a cap on prices for Renewable Identification Numbers (RINs) to appease oil refinery interests, biofuel interests went into high gear to get the word out about how that action would devastate the Renewable Fuel Standard (RFS). A White House meeting was reportedly set for today (March 12), and then abruptly cancelled, but that did not stop a rally that was set up at the farm of Bill Couser in Nevada, Iowa with just 24 hours notice. 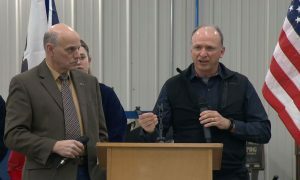 The main attraction at the rally was two industry representatives who were part of a meeting with President Trump on March 1 – fuel retailer Charlie Good and ethanol producer Rick Schwarck. 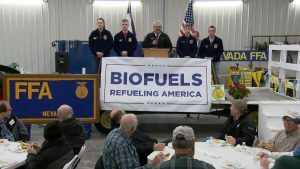 Good and Schwarck described an “intense” meeting which included other biofuel representatives, oil refiner interests, Iowa Senators Grassley and Ernst, Senator Cruz of Texas and several cabinet members. The first part of the discussion revolved around allowing 15% ethanol blends to be sold year round by treating it the same as E10. “If you allow us to sell (E15) year-round, nationwide, we’ll flood the market with RINs and price will take care of itself, and (the president) understood that,” said Good, noting that everyone in the room agreed that was a good idea.